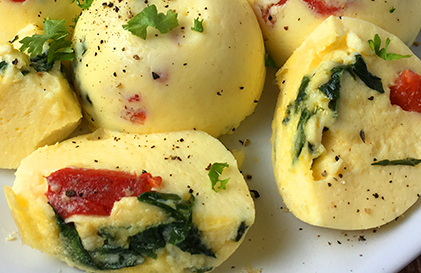 This recipe for Instant Pot egg bites features gouda cheese, fire roasted red peppers and fresh spinach. The creamy, rich flavor is absolutely delicious and cooks to perfection in your Instant Pot. If you like the Starbucks sous vide eggbites, then you’re gonna love these! Gouda is a creamy, full flavored, semi-hard yellow cheese from The Netherlands. I find it to be the perfect flavor and texture for egg bites. Just 3oz, about 1/4 cup of freshly shredded gouda will do. Fire roasted red peppers are something you should keep in your pantry. They come in small jars and are wonderful in so many recipes. For this recipe, we dice up about 1/4 cup full. For the spinach, I like to use a handful of fresh spinach, which comes out to about 1/2 cup. And here’s special step that really makes a difference… saute the diced red peppers and spinach in a little butter for about a minute in your Instant Pot. Then simply spoon the mixture into the silicone egg bite cups. I like fresh spinach SO much more than frozen, and this little extra step makes all the difference.
. They’re easy to get, affordable and are the perfect size for out egg bites. Even though it’s made of silicone, I still spray them with non-stick cooking spray. It makes getting them out of the molds a ton easier and cleanup is a breeze. When cooking, you’ll cover the egg bite mold with aluminum foil and place it on the trivet with 1 cup of water in the Instant Pot. Then it’s 8 minutes on the “steam” setting, and 10 minutes natural release. After the minutes NPR you can release the rest of the pressure and carefully remove from pot. Remove the foil and let it set cool for 5-10 minutes. Then the egg bites will slide right out. 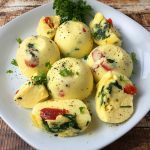 Instant Pot egg bites are excellent for a quick, protein packed breakfast on the go too. I’ll often make 2 batches on the weekends, then we have them all week to bring to work, where a quick minute in the microwave heats them perfectly. Or the kids can eat them up quickly before school instead of a donut or pop-tart they seem to love to much. Serve on a plate with some fresh ground black pepper and fresh parsley. Chop spinach and red peppers. Add a 1/2 tbs of butter to Instant Pot and set to “saute”. When hot, add spinach and red peppers and saute for 1 minute. Press cancel. 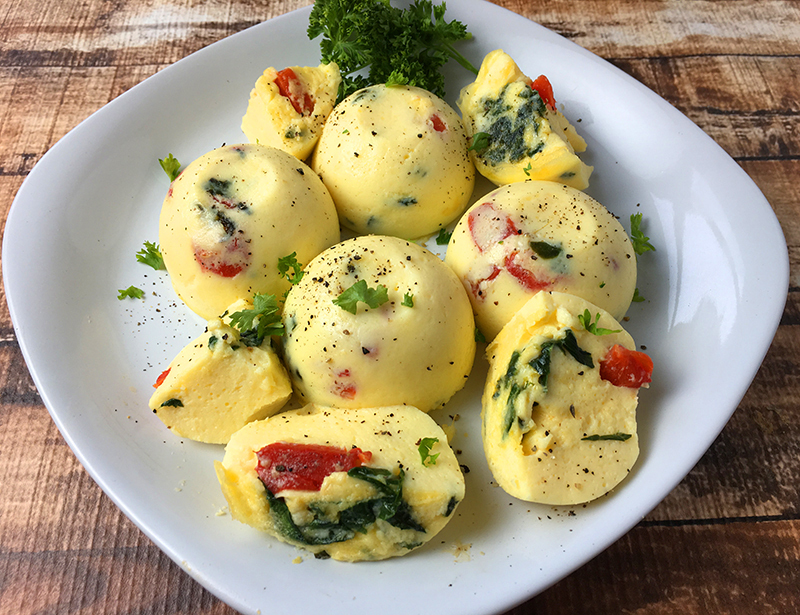 Spray silicone egg bite mold with non-stick cooking spray and spoon red pepper and spinach mixture into each cup. Set aside. In a blender, blend the eggs, gouda cheese, cottage cheese, heavy cream, onion powder and salt for about 30 seconds. Pour egg batter into each egg bite cup about 3/4 full. When all are full, use a spoon to mix the batter with the spinach and red peppers a little more. Add 1 cup of water to Instant pot, cover egg bite mold with foil and place on trivet and lower into pot. Secure lid with seal closed and set to “steam” for 8 minutes. When cycle is complete, let naturally release for 10 minutes, then quick release the rest. Remove foil and let stand for 5-10 minutes to cool before removing and serving. WOW this recipe is an exact DUPE for Starbucks’ egg bites. I would know; I (used to) them ALL the time! I followed the recipe exactly, used smoked Gouda from Trader Joe’s, blended everything in my nutribullet. I never leave msgs on food blogs but this recipe needs an award. You’re a genius! Thank you so so much. Just got my instant pot and your recipe looks delishious! They say you can refrigerate these for a week (if they last). How do th reheat? Or do you eat them cold? (Yuck!)! Have you tried making two pans at once (on a double rack). I don’t have cottage cheese or whipping cream or half and half. Just 2% milk. Can I still make the egg bites. The short answer is yes, you can. 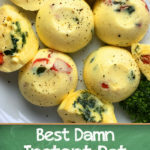 But, the cottage cheese and cream are essential to the texture and basic foundation of the egg bites. Without them, the recipe will still work but you may need to experiment with times just a bit. The texture will be quite different but ok.
Made these this morning. The store didn’t have any gouda so I used goat cheese………ridiculously good! Thank you for sharing this recipe with us! I just put nine in and didn’t cover with foil….are they going to be a mess?? Followed this recipe exactly. Oh my- game changer. They are so delicious!! No more paying $5 for two!!! Made these this a.m. and followed the recipe exactly. They came out perfect! I sprinkled with pepper and cayenne and served with sourdough toast. Will definitely be making them again. They do seem perfect for taking to work. That is, if I don’t gobble them all up before I go back to work in a couple of days! This was my first time trying one of your recipes, but I will be searching for more! Thank you! Thanks so much, Carol! And you’re speaking my language for sure with sourdough toast. I think i could have sourdough bread with all my meals! Thanks for the feedback. If I were to substitute a lower fat milk or soy milk for the cream, how much would that change bits? Just looking to make them a bit lower in calories. Hi Naomi, yes you can substitute out the cream. You can experiment quite a bit actually. You won’t get quite the same creamy, rich flavors and textures, as with most foods. But absolutely experiment and have fun in the process! 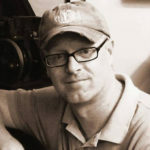 I will have to try it out and see how it goes:) thanks! I made some this morning and I did have a batch that didnt set up because I used too much cheese. This is definitely a favorite recipe in our house now. I’m so glad you like it! Yeah sometimes it takes some adjustments to the times, but once you get it, they’re so awesome to make. Thanks for the feedback! Made mine with crab and asiago cheese. they were amazing. Made these for breakfast today. Added chopped ham with the veggies. This recipe made 13 delicious egg bites. I served one egg bite on each side of toasted English muffins and topped with Hollandaise sauce. I have extra egg bites for breakfasts during the work week! This recipe is a winner! Awesome, DeeAnn! So glad you liked them! Yeah the Gouda really is amazing in these. Thanks for this great recipe! Followed it to the “T” and added a smidge of garlic and oregano. Love them! Got the silicone molds just for this. They are also great for making big huge ice cubes! Cook them “faux sous vide”. Put the mold into a large pan of boiling water in the oven or on the stove top if you have a large enough stock pot.. I noticed this question about freezing was already asked, but not answered yet. Has anyone frozen the egg bites? If so, how did they turn out and how long to put in the microwave to heat up? These sound delicious! Thanks in advance for answering my questions! although I have not tried it I have read that they do freeze well. These came out sort or mealy and not at all smooth creamy as I expected. Any idea what might have gone wrong? So sorry they didn’t come out as expected, Sabrina. Anything from altitude to ratio of ingredients could have affected the outcome. Did you let them cool and set after removing from the cooker? Letting them cool and set can make a big difference. You can always add another 1 or 2 minutes to the cooking times as well. Can you stack two of these silicone egg molds and cook together in the IP? Do you adjust the cooking time for 2? Hi Nicole, you shouldn’t have to but, with that said, I’ve had times where I have indeed needed to add a couple of minutes. I think it depends on the amount of cottage cheese and cheese and added ingredients more than anything. Hearing that I can stack two of my Silicone egg bite molds in my IP is a game changer!!! I love this recipe but my family can go though many of these bites! I can not wait to try stacking my two molds! Do you think these could freeze well? They do! I’ve done it (with a different recipe, but close enough that i doubt it would change the result) and they freezer like a dream. When I’m feeling ambitious I’ve made 14 or so, frozen them, and then left them in my work freezer so I always have brekkie even if I’m too rushed at home. Hi Jennifer… i’ve added nutritional info to the recipe. These were awesome! Brought them to work and was a great breakfast too. I have the Cuisinart pressure cooker. Would I just cook them all low pressure. There is no steam button on mine. Great question Kathleen… and it seems there’s some “mystery” in many of the actual functions of several of the buttons. However, from everything i’ve read, the “steam” function of the IP is high pressure for 10 minutes. I’d say go ahead and use your high pressure setting for the 8 minutes. I’d love to hear how they turn out for you. Check back and let us know! I have a large family – could you use two molds and stack them in the IP? Hi Suzie, you can certainly use small jars or ramekins. I’m guessing that small bowls or custard cups would likely be a about the same amount of time. You could always add an extra minute if the size is much larger than a few ounces.